The news 'they' don't want you to hear. Because it isn't true. You are here: Home / Politics / Did Jeremy Corbyn fart during Festival of Remembrance? 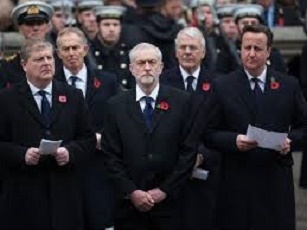 Did Jeremy Corbyn fart during Festival of Remembrance? Labour Leader Jeremy Corbyn has found himself at the centre of controversy today following rumours that he may or may not have passed wind at some point on Remembrance Sunday. The revelations that Mr Corbyn might have trod on a duck if not on Sunday then quite possibly at a different state event have also sent shock waves through a social media already incensed by accusations of Corbyn sporting a disrespectful beard, wearing a poppy ironically and bowing too much when he met the Queen. “You’re only supposed to put your head down 40 degrees or so when you bow, but his head nearly touched the floor. He was obviously taking the piss.” One user tweeted. Press one of these lovely buttons! « Was this a UFO spotted over London? Prince Charles "Putin is just like Arnold out of Different Strokes"
Theresa May "I'll almost certainly still be in office by Christmas"
Penny Mordaunt "Disabled people are taking the piss"